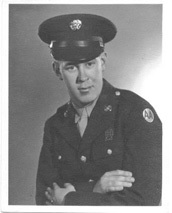 Don and his troops left Boston the beginning of August 1944. They landed in England at Portsmouth. They spent only thirty-six hours in England, getting served dried-up lima beans and bread before being sent directly to France. The troops landed on Omaha Beach two and a half months after D-Day. Don climbed the same steep shoreline, but at least it was not under fire. Don got his orders to join the 9th Infantry Division, 60th Infantry Regiment, Company E, as a replacement shortly after landing. They travelled by truck past St. Lo, which was mostly destroyed except for the chimneys. He joined his unit at the Meuse River where Company E was scheduled to cross at midnight. Don was worried because he could not swim. Luckily for him, another unit went instead. Don's first experience in battle was in the Hürtgen Forest, when they were assigned to take ammunition to the front line. The Hürtgen Forest was a manmade forest. "There were rows of trees that were about fourteen feet high." On the way back to the unit, everything broke loose. "We didn't know which way to go. All I saw was bursts of shrapnel flying everywhere. When bullets were close they made a loud snapping sound and scared me to death!" Don quoted. Their only protection was behind the trees. At the end of the battle, not a tree in this forest was taller than six feet. Don dropped down with his head between the large roots of the tree. Finally when the air bursts stopped, he saw a large piece of hot shrapnel lying right between his legs. "That was the scariest and now the most humorous thing about that particular battle that I remember!" recalled Don. Don was a mortarman. Six men were assigned to each 60 mm mortar. Three men to fire the mortar, using a tripod, and three men to carry ammo. At one point, they were instructed to set up their mortars. They had already fired two rounds when an officer came up in a jeep and yelled, " What the hell are you doing in that field? That's a mine field!" They carefully took their mortars and walked out following each other's footsteps. They set up in a different area. The Siegfried Line had hedgerows waist high, all matted with roots and weeds. The bushes and trees were up to twenty feet high, and the Germans had planted mines in front of them. The 9th Infantry Division tanks were equipped with chains and balls in front to blow up the mines, so they could get through. After ten days at the front, they were sent back to a rest area. After about five miles of trudging along, they wondered if their ride would ever get there. The Lieutenant said that they were almost to the rest area, so they might as well keep going. The troops arrived at an open area that had a foot of snow on the ground. They needed to clear the area before they could put their sleeping bags down to get some sleep. After dark it was impossible to move about. "The sky was as black as the mud on our faces." It was now getting very cold and harder to get around," remembered Don. Don's unit was called to help assist near Bastogne. The Germans had made a counter-offensive, the Battle of the Bulge. American troops had been overtaken by the Germans and their uniforms and equipment had been stolen. Don and the rest of his company were near a town when three of them were sent to do guard duty in the dark of night, near an outpost. 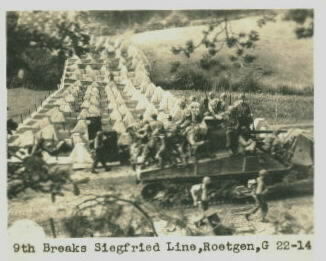 Orders were to keep the Germans from infiltrating the line. Their replacements came and they headed back. The next thing they knew, they were all hit on the back of the head and knocked out. Don stated, "I still have the knob at the base of my head." Don remembered running across an open field towards the Germans. They were firing at the Americans and every third bullet was a tracer bullet that they could see coming straight at them. As Don ran, he saw some of his buddies fall. It was dusk when they got to a safe house, and their 2nd Lieutenant told them to hold the area. On February 9, 1945, near the German town of Schmidt, Don was moving alongside a building, when something heavy came off the roof and hit his right arm. He thought it was an 88mm shell that was a dud. His arm became paralyzed as soon as he was hit. Don later found out from his service hospital records that it was a large chunk of cement from the shelling of the building. Don was taken by jeep to an evacuation hospital. There, he was given a shot and then taken by truck to Paris to the 108th General Hospital. He was in the hospital for fifty-two days. After a while, he was able to get around. Don did eventually join some other GIs and they went to see more of the city. The sights of Paris did not impress him. 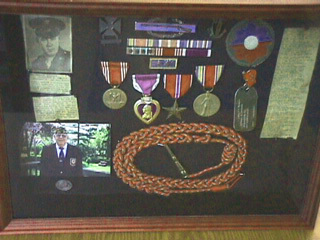 Don left the hospital on March 22, 1945. He returned to his outfit who were now in the German Hartz Mountains. The organized resistance ended around April 20. Many German prisoners were just young boys, taken near the Mulde River. The German soldiers preferred to surrender to the Americans rather than the Russians. The 60th Infantry Regiment ended up at the junction of the Mulde and Elbe Ribers near Wolfen and Jessnitz. Don remembers being on the Elbe River when they met the Russians. They shook hands and said, "Today we shake hands, tomorrow we fight."